Simultaneously restless and enchanted, the primary speaker of these poems is a tourist in the truest sense. She finds herself on trains, in the backcountry of the American wilderness, in crowded European hostels, and in Vietnam, eating a partially fertilized egg. All the while, Michigan, the landscape of childhood, serves as her reference point ("A rustic sort of place I can't back away from"). Inspired by the Buddhist concept of anatta, or "no-self," the speaker navigates unfamiliar terrain, sparking the question of identity and the agent of its construction. The poems ask how through perception the body metabolizes experience. From this intersection the passionate investigation of consciousness takes flight, framing the slippage between thinking and being, the feast of the subconscious and the seeds planted from waking life, the impermanence of a given moment, versus the materialism of memory, the reality of isolation despite the presence of a crowd, the influence of culture versus biology's common baseline. Drawing from contemporary neuroscience and rare case studies, the poems illuminate the peculiar interrelated aspects of the mechanisms of the brain and personality. But there is nothing clinical about these poems, culled from dreams and memory fragments. The question of consciousness gives rise to the distinct human ability to reflect, to invent. Which is what the poems-poignant, strange, radiating musicality-enact: someone gropes for the deer mount its goofy snarl and patchwork hide a ruse underway laughter in the pantry the deer lifted into someone's sleep (from "Staff After Hours") Not the love a mile underground on a train that slows into the station like a sore arm bending, but the kind boarded on a ship and sailed hard into the storm we've made of ourselves. 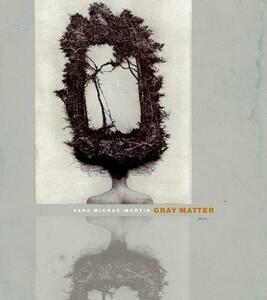 (from "Please do Not Touch") Gray Matter: 1. the material of the brain. 2. an expression naming an idea or situation held in shadow. This book tangles with the unknown, but also celebrates the seductive curiosity its mystery provokes. It is a love letter from the imagination to the scientists and philosophers who, despite remarkable attempts, still cannot locate its source.